Biggest Commercial Opportunity in Mandurah! 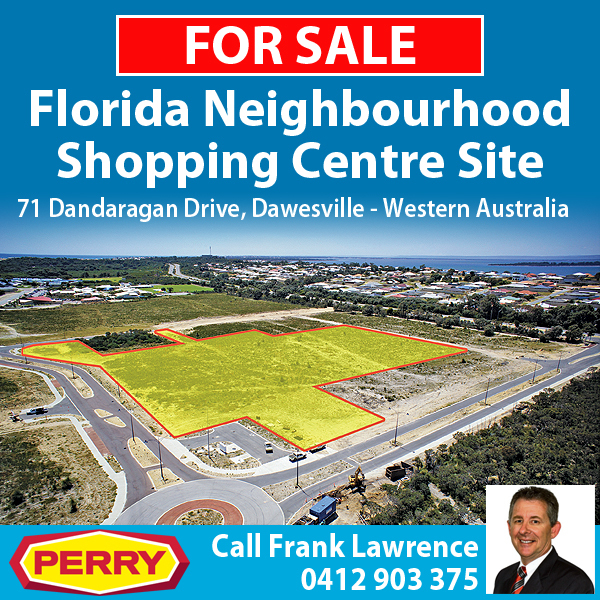 H&N Perry are offering developers the chance to purchase a prime commercial shopping centre site in Dawesville, Western Australia. The Florida Neighbourhood Shopping Centre site is a massive 2.2864 hectare lot with three street frontages located within the Florida Beach subdivision. The site is fully serviced and titled with an approved Outline Development Plan. It has the potential to yield up to 5000m2 of retail floor space to service residents in Port Bouvard, Wannanup, Dawesville, Bouvard, Herron and Lake Clifton. Mandurah is one of Australia’s fastest growing regional cities and the City of Mandurah have identified this area as being one of the huge growth areas of the muncipality. They have forecast that the population for these suburbs alone will reach over 11,000 people by 2016 increasing to 16,000 by 2026. The site is ready for immediate development, has two primary schools within a kilometre and a future high school site directly opposite. This is a rare opportunity that should be snapped up immediately. Land A Bargain Before It’s Too Late! The Florida Partnership have recently released three exclusive homesites for sale in the Florida Beach Estate. This is the first time that land has been released in the area for quite a few years so if you’ve been waiting, now’s your chance! The homesites are priced competitively from $130,000 and they are expected to attract strong attention from first home buyers and investors alike. Positioned on the beach side of the road, the parcels of land are just a short walk to the Florida Beach Foreshore Reserve and a choice of private and public primary schools. They are also close to a proposed shopping centre which has been approved by the Western Australian Planning Commission and is awaiting development. These lots are particularly attractive to first home buyers who have been given an extra $3000 by the State Government, bringing the First Home Owners Grant to a generous $10,000 for new homes built after 15th September this year. To sweeten the deal even further, the developers are offering purchasers generous early building incentives that include fencing and front landscaping. Priced from $130,000, there has never been a more affordable opportunity to live this close to a quality beach. These blocks won’t last so we suggest you secure your today. 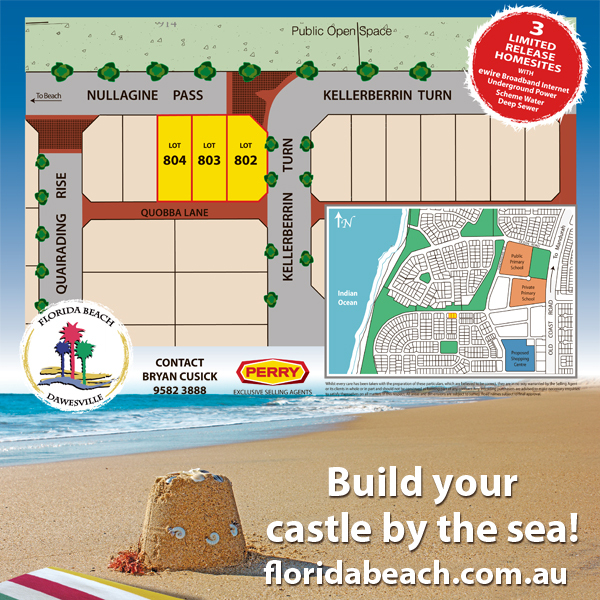 H&N Perry are the exclusive selling agents for Florida Beach Estate – call Sales Manager Bryan Cusick anytime on 9582 3888 before it’s too late!